Sunrisers Hyderabad chased down a massive target of 199 with one over to spare courtesy 110 partnership between Warner and Bairstow. * How easy was that? Hyderabad have chased this huge total with 6 balls to spare. Yes, there were a few hiccups but to be honest, they were always in control of the game. The foundation was laid by their openers who smashed and when I write smashed I mean smashed 110 runs. 23.39 IST: Jofra Archer to Rashid Khan, SIX! Rashid finishes it off in style! What a whip that was. He shuffles across and Archer bowls it full on the pads. Khan flicks it over the square leg fence for a biggie. The crowd here are going bonkers as HYDERABAD WIN BY 5 WICKETS! 23.37 IST: Jofra Archer to Rashid Khan, FOUR! That is probably the shot which seals the game for the hosts. 4 in 7 now. Archer misses the yorker by just and ends up serving a half volley outside off. Rashid strokes it through covers, away from the sweeper and into the fence. 23.32 IST: Jaydev Unadkat to Rashid Khan, 2 runs. A couple to end! 8 from the over, a good one for the hosts in the context of the game. 12 from 12 needed now. Short and on middle, Rashid looks to pull but it goes off the bottom towards deep mid-wicket for two. 23.31 IST: Jaydev Unadkat to Yusuf Pathan, WIDE! Too high! Short and goes way above the batsman's head. Wided. 23.22 IST: Jofra Archer to Yusuf Pathan, SIX! Eases all the pressure that was building! Powerful shot! Short and on middle, Pathan stands tall and pulls it over the mid-wicket fence. 22 needed in 22. 23.19 IST: Shreyas Gopal to Rashid Khan, No hat-trick! Rashid plays it well as he works it through mid-wicket for a single. 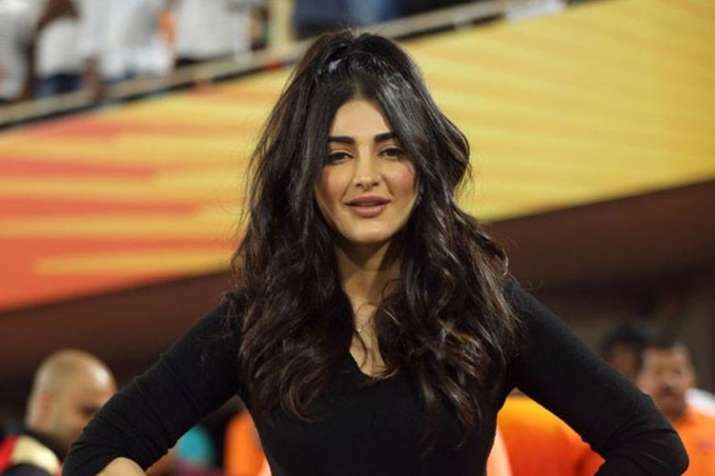 * Rashid Khan is the new man in and he will face the hat-trick ball. * Shreyas Gopal is back into the attack. 23.10 IST: Jaydev Unadkat to Manish Pandey, Wide! Unadkat tries to welcome Manish with a bouncer. It bounces too high and has been signalled as wide. * Manish Pandey is the new batsman in. 23.08 IST: Jaydev Unadkat to Kane Williamson, OUT! Unadkat has the last laugh. Length delivery outside off, Williamson looks to cut it but he does so uppishly. The ball flies to the fielder at point. Rahul Tripathi there takes a comfortable catch there. Will this wicket change the tide of the game? 23.07 IST: Jaydev Unadkat to Kane Williamson, FOUR. Williamson wants a piece of the act as well. Short of a length outside off, Williamson cracks it through point for a boundary. 23.05 IST: Jaydev Unadkat to Vijay Shankar, SIX. Slower ball on off. It is full, Shankar gets under it and hits it cleanly over mid-wicket fence for a maximum. The fielder in the deep can just watch it sail over him. 23.03 IST: Dhawal Kulkarni to Vijay Shankar, SIX! All the way! Second maximum in the over! This time it is over mid-wicket. The slower ball and it is picked early. Shankar pulls it over the fielder and over the fence there. 22.54 IST: Jaydev Unadkat to Vijay Shankar, In the air...but safe. Full length delivery on off. It was cross seam delivery so it stays on the pitch and comes. Shankar chips it in the air but it is too far away from the cover fielder inside the circle. Two runs taken. * Jaydev Unadkat comes into the attack. 22.51 IST: Ben Stokes to Vijay Shankar, FOUR! Excellent pull shot! Another short ball this from Stokes. Shankar gets on top of the bounce and pulls it through mid-wicket. A boundary. * Vijay Shankar is the next batsman in. 22.47 IST: Shreyas Gopal to Jonny Bairstow, OUT! Bairstow holes out. Dhawal Kulkarni drops a regulation catch at third man in the previous over and then redeems himself by taking a blinder at long off. 22.42 IST: Ben Stokes to Jonny Bairstow, FOUR. 85 now needed in 61! A wicket has fallen but the boundaries keep coming. Short and outside off, Jonny slashes hard at it. It goes through point, beating the dive of the fielder in the deep and a boundary results. * Kane Williamson is the new man in. 22.40 IST: Ben Stokes to David Warner, OUT! In the air... taken! Ben Stokes strikes! He is pumped up! A much-needed wicket as this partnership was taking the game away. An excellent short ball by Stokes to get rid of Warner. It is bowled at a good height, head height to be precise. Warner takes his eyes off the ball while pulling. Only manages a top edge towards fine leg. Dhawal Kulkarni runs in and takes it. 22.37 IST: Ben Stokes to Jonny Bairstow, FOUR. If Warner does not hit you, Bairstow will. Short and outside off, Jonny waits for it and then cuts it through point for a boundary. 22.28 IST: Shreyas Gopal to Jonny Bairstow, Misfield and a FOUR! Kulkarni was done in by the turn there. Bairstow sweeps it hard towards deep square leg. Kulkarni tries to stop it with a not a lot of conviction. Does not do so and concedes a boundary. * Strategic break has been signaled! Hyderabad have started this chase in some manner. They are going above the run rate needed and are doing it quite easily. They would the two can continue the same. Rajastahan on the other hand, need a wicket here or this game will keep slipping away. 22.24 IST: Jofra Archer to Jonny Bairstow, FOUR! Bairstow getting into the act now. Good length ball on middle and leg, Bairstow handsomely flicks it over square leg for a boundary. 22.23 IST: Jofra Archer to David Warner, Fifty for David Warner. What a knock this has been. He does not get there in the most convincing manner but he has been exceptional tonight. Back of a length delivery on middle and leg, Warner lobs it with a flat bat over mid off for a couple. 22.21 IST: Jofra Archer to David Warner, FOUR! Don't bother stopping that, it will rip your arms off. Length delivery outside off, Warner gets his front foot away from the line and slaps it hard through mid off for a boundary. 22.18 IST: Ben Stokes to David Warner, FOUR! Slapped! Third boundary in the over! Short and this one sits up to be hit. Warner transfers his weight onto the back foot and then clobbers it over covers. 22.17 IST: Ben Stokes to David Warner, FOUR! Not off the middle but in the first six, a decent connection will fetch you a boundary. Full and on off, Warner lofts it over mid off. It seems to be off the bottom part but enough to clear the fielder and another boundary. 22.14 IST: Jofra Archer to Jonny Bairstow, Once again the extra pace causing problems! It is short and on the pads, Jonny looks to pull but misses to get hit on the pads. Just a single from the over, one ball to go, need to end it well. * Jofra Archer is into the attack. 22.08 IST: Well bowled! That is one delivery, which every batsman will find difficult to hit. A yorker on off, Warner looks to jam it out but it goes off the inner half towards the leg side for a single. * Krishnappa Gowtham to bowl from the other end. * WOW! WHAT A BATTING PERFORMANCE THAT IS! Rajasthan have powered themselves to a mammoth total here. They did not start in the best of manners as they lost Buttler early. They could not get going in the Powerplay as the ball seemed to be sticking in the surface. 21.41 IST: Bhuvneshwar Kumar to Ben Stokes, FOUR! No, the can't! They needed a biggie but they get the next best possible result. Edgy boundary. The visitors won't care though. This is bowled wide outside off. Stokes throws his bat at it. It flies off the outside edge and over short third man. 21 from the last over and RAJASTHAN FINISH WITH 198 ON THE BOARD! 21.40 IST: Bhuvneshwar Kumar to Sanju Samson, FOUR! 100 for Sanju Samson! Take a bow young man. What a knock this has been from him. He has dominated the bowlers right from the word go. His second in the Indian T20 League. He gets there in style as he flat-bats this towards the long on fence. Pandey there run and dives to his left but can't stop it. 21.36 IST: Bhuvneshwar to Stokes, FOUR! Innovation at its best! Stokes initially wanted to scoop it over fine leg but then sees the ball is full and outside off. He adjusts and manages to scoop it over short third man for a boundary. 28 from Kumar's last 7 balls. 21.32 IST: Sandeep Sharma to Sanju Samson, Superman Warner to the rescue. Overpitched delivery on off, Samson flicks it wide of deep mid-wicket. Warner steams to his right and saves the ball from going to the fence with a brilliant dive. Saves a couple. * Sandeep Sharma is back into the attack. 21.29 IST: Bhuvneshwar Kumar to Sanju Samson, FOUR! Deft! Playing with the field here is Samson. He sees third man is up so stays leg side of the delivery. At the very end just opens the face and then guides it past short third man and another boundary. 21.28 IST: Bhuvneshwar Kumar to Sanju Samson, FOUR! 14 from 3 now! Kumar is not sure where to bowl here. He again goes for a yorker but Samson once again plays it very late. He opens the face of the bat and then guides it past point for consecutive boundaries. 21.27 IST: Bhuvneshwar Kumar to Sanju Samson, FOUR! 10 from the first two! Another excellent shot. Kumar bowls the yorker on middle, Samson at the very end just opens the face of the bat and guides it past point. A boundary. *Siddarth Kaul is back into the attack. * The new man in is Ben Stokes. 21.18 IST: Shahbaz Nadeem to Ajinkya Rahane, OUT! In the air... taken! Rahane holes out. End of a brilliant innings from him and a top, top partnership comes to an end. Rahane looks to continue going after the left-arm spinner as he uses his feet to get to the pitch of it. Does not do so but still goes ahead with the shot. He only gets more height than distance and Warner at long on takes it with ease. A much-needed wicket for both, the hosts and Nadeem as he has not had a good time with the ball. Can Hyderabad now manage to pull things back a little? * Strategic Break - Sanju Sampson and Ajinkya Rahane are going along well here. Rajasthan are 122/1 at the end of 15 overs. They will be looking to get more than 40 runs in the last 5. 21.10 IST: Rashid Khan to Ajinkya Rahane, FOUR. Reverse sweep and it has come off! It flies off the outside edge and over the point fielder. No one in the deep and a boundary. Once again early in the over. Pressure on the bowler now. 21.07 IST: Sandeep Sharma to Ajinkya Rahane, FOUR! What a shot! Good length delivery outside off, Rahane comes down the track, makes room and whips it through ocvers for a boundary. Rashid Khan puts in a dive to save the boundary but misses it. 21.01 IST: Rashid Khan to Ajinkya Rahane, 50 for Rahane, the skipper leading from the front here. He began slowly but now has got into his zone. He picks the googly and works it through mid-wicket for a single to get to that milestone. He knows his job is not done yet. This is his 27th in the Indian Premier League. 20.54 IST: Siddarth Kaul to Ajinkya Rahane, FOUR! In the gap and Rahane now seems to have stepped on the accelerator. He is into the 40s. Short and on middle, Rahane stands tall, gets on top of the bounce and pulls it through backward square leg for a boundary. 20.52 IST: Siddarth Kaul to Sanju Samson, This time he times the flick nicely and hits it through square leg. A run taken. The umpire though has his one hand raised sideways. IT IS A NO BALL! Kaul has overstepped. Free Hit time. * Strategic Break - An even contest so far. Hyderabad have got rid of Jos Buttler but Samson and skipper, Rahane have steadied the ship and are looking good. 20.22 IST: Sandeep Sharma to Ajinkya Rahane, FOUR! This time Rahane times it to perfection. Shorter delivery on off, Rahane keeps his balance and whacks his pull through mid-wicket for a boundary. * Sandeep Sharma replaces Bhuvneshwar Kumar. 20.09 IST: Sandeep Sharma to Ajinkya Rahane, This time Rahane hits it to the right of Nadeem at square leg for another couple. Sandeep is guilty of bowling a little too straight here. 20.08 IST: Sandeep Sharma to Ajinkya Rahane, Good shot for a couple! Takes the aerial route as he flicks it over mid-wicket. Not off the middle but enough to clear the ring. Two taken. 20.06 IST: Sandeep Sharma to Ajinkya Rahane, Well that one stuck in the surface! Length and Sandeep may have rolled his fingers over that. It was on middle, Rahane looks to flick but is a touch early in the shot. He gets a leading edge which falls short of mid on. * Sandeep Sharma to bowl from the other end. 20.04 IST: Bhuvneshwar Kumar to Ajinkya Rahane, Rajasthan and Rahane are underway! A little too straight from Kumar. Rahane plays it late through square leg and takes two. * A halt in play here! Rahane seems to have a problem with the sightscreen. It has been solved and we are all set to go. 20.01 IST: Bhuvneshwar Kumar to Ajinkya Rahane, Almost plays it on! A little outside off, Rahane looks to guide it down to third man but it is way too close to play that shot. He ends up chopping it to the keeper. 19.57 IST: We are all set to begin. The players and umpires are out in the middle. Ajinkya Rahane and Jos Buttler will open the batting for Rajasthan. Bhuvneshwar Kumar will start the proceedings for Hyderabad. 19.42 IST: Hyderabad skipper, Kane Williamson, says he wanted to bat but he is fine with bowling first. Further adds, he too expects the wicket to not change a lot. Informs they have a couple of changes, he comes in for Shakib and Shabaz Nadeem replaces Hooda. 19.39 IST: Rajasthan skipper, Ajinkya Rahane, says he wants to bat first. Further adds he is not sure how the wicket will play but he believes it to remain the same throughout. Informs he is playing the same eleven. 19.35 IST: PITCH REPORT - It looks a good one to bat. There might be some assistance for the pacers with the new ball and a little spin later on but overall, it should be a good one to bat on. 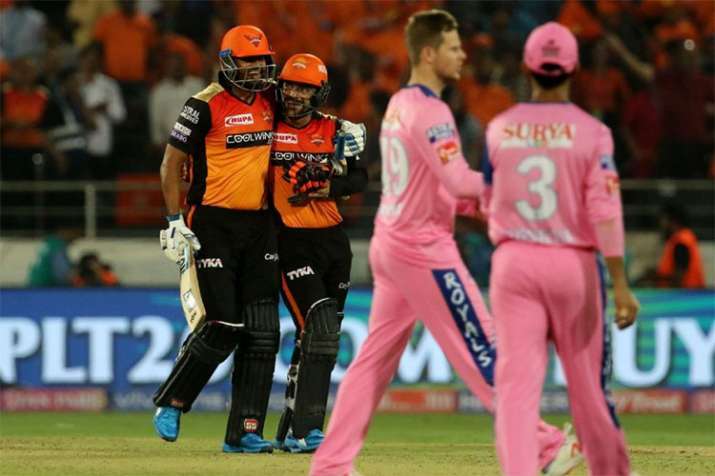 19.30 IST: Rajasthan Royals skipper Ajinkya Rahane win the toss and opt to bat against Kane Williamson's Sunrisers Hyderabad. 19.29 IST: Leggie Rashid Khan is all set to spin Rajasthan Bowlers on his fingers. 19.27 IST: The battle of skippers is on between Kane Williamson and Ajinkya Rahane. 19.22 IST: David Warner fans are ready for another masterclass from the Southpaw against Rajasthan Royals. 19.10 IST: The Orange Army has arrived at the stadium and ready for their first home game this season. 19.00 IST: Rajasthan Royals are all geared up for their first away game of IPL 2019. 18.57 IST: The Orange Army are in full support here at the stadium! Are you team Orange or Team Pink! 18.24 IST: The Orange Army record at home since 2017 is quite amazing.
.@SunRisers have an enviable 11-3 win record at home since #VIVOIPL 2017. 18.21 IST: The players of Sunrisers Hyderabad are off to the Rajiv Gandhi International Cricket Stadium. Hello and welcome to our live blog of the SRH vs RR clash live from Hyderabad. The TOSS will take place at 7.30 PM IST, while play will commence from 8.00 PM IST.